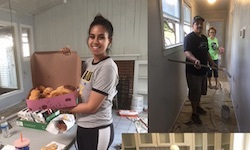 Merced, CA (July 25, 2018) - Over 25 of Centurion & Supreme employees and their families served together with Habitat for Humanity of Merced County to paint a home for a family in need. Jan Sorge, President of Habitat for Humanity of Merced County, organized the volunteer service day with Centurion & Supreme. Team members dispersed into groups to paint rooms throughout the house. The younger volunteers had the advantage to fit in and paint the cabinets while the rest of the volunteers painted the walls and baseboards. Other volunteers cut branches, pulled weeds and discarded trash. Sunshine Doughnut of Atwater provided doughnuts and water to the volunteers. Before lunch, a volunteer showed their appreciation of their ability to serve with fellow employees during prayer. Habitat for Humanity is part of a global, nonprofit housing organization operated on Christian principles that seeks to put God’s love into action by building homes, communities and hope. Habitat for Humanity of Merced County is dedicated to eliminating substandard housing locally and worldwide through constructing, rehabilitating and preserving homes, by advocating for fair and just housing policies also by providing training and access to resources to help families improve their shelter conditions. Habitat for Humanity was founded on the conviction that every man, woman and child should have a simple durable place to live in dignity and safety and that a decent shelter in decent communities should be a matter of conscience and action for all. About Centurion Boats: Innovation has always been the hallmark of Centurion boats. Now, thanks to new product, leadership and Correct Craft company culture, innovation is running deeper than ever, into a re-imagination of the Centurion brand. Water sports enthusiasts are embracing Centurion boats for the world’s best waves, wakes and ride, as well as ambitious design and inspired craftsmanship. Time to re-imagine your ride, in a Centurion. About Supreme Boats: The Supreme story begins with the World’s best waves, wakes and ride, but that is only the beginning. A Supreme boat is much more than World Championship performance. We are the only Affordable Premium Brand that resonate with water sports and boating enthusiasts, ranging from performance to functionality to quiet to details to relationships. The proof of Supreme Boats perfect ride is on the water with the 2018 S202, S224, S211, S238, S21, S226. Last edited by markj; 08-01-2018, 11:45 PM.